Are you thinking of purchasing a wheelbarrow for your gardening needs? Did you know that there are different uses of a wheelbarrow? This is the reason why its popularity has never died down despite how the modern the world is becoming. There are now a lot of wheelbarrow in the market, and all you need to do is to choose the best wheelbarrow that will cater to your needs. Above are the best wheelbarrow that you can have for yourself and the needs that you have. All are all good wheelbarrows, but in every review, there should always be one winner. The winner for this review is the Marathon Dual-Wheel Residential Yard Rover Wheelbarrow. The reason behind this is because, despite the light-weight that it has, it can carry a load of up to 300 pounds. The materials are also made out of sturdy ones which mean that it can serve you more. A wheelbarrow can be made out of plastic, wood, or metal and is composed of only one wheel. Some wheelbarrows have one handle, while there are some that have two. People created this to help workers and gardeners to make their tasks easier. It is used in moving certain materials quickly without putting a strain on their back. The wheelbarrow is considered as a tool that is versatile and very useful on the farm and even in the construction business. People who love gardening are using a wheelbarrow to help them reduce the back strains that they typically experience when moving compost or a bag of soil that is too large. If you have a big garden, you can transport trays using the wheelbarrow, which will not only make things easier for you but it will also require lesser trips. Typically concrete and masonry workers are the frequent users of metal made wheelbarrow since they are using it to mix cement and concrete trucks. Usually, they will pour concrete on the wheelbarrow itself and pour some water for them to be able to mix it using a shovel. They can also use this to help them transport debris and other heavy construction stuff from one area to another. They are also using a wheelbarrow when cleaning up the area that they’ve been working on. People who are landscapers are also using a wheelbarrow to transport their stuff from one place to another. Some are using trucks to do this, especially if they are working on something that is big. Landscapers usually transport shrubs and small trees using a wheelbarrow. They can also use it to carry the fertilizer that they will be putting in the plants. Now, if you are planning to purchase a wheelbarrow, it would be best to consider some things, for you to ensure that you are buying the one that you truly need. Below are some of the things that you need to find. There are two types of the wheelbarrow, which are the plastic ones and the metal ones. When purchasing a wheelbarrow, you need to consider its use for you. Typically a plastic made wheelbarrow is perfect for stables since it is mainly used for moving hay, shavings, and straws. They may be bulky, but they are light in weight, so you don’t have to worry about anything at all. The metal made a wheelbarrow, on the other hand, is more ideal for loads that are heavier. Another thing that you need to consider is the space where you will be storing your wheelbarrow. If you are choosing a metal wheelbarrow, you need to make sure that you have enough space to store it inside or something where you can protect it from the sun or the rain. The reason behind this is because the metal can easily rust if it is outside for a long period. You can store the wheelbarrow in your garage or a shed. If you have enough space then choosing a wheelbarrow that is big sufficiently to help you with your needs is essential. There are two types of the wheelbarrow, which are the single and dual wheels. The single wheel one can be maneuvered easily. But if you are looking for stability, then a dual wheel is the one for you. But put in mind that you can easily tip a wheelbarrow that has a single wheel. Now you also need to consider yourself when buying a wheelbarrow. You need to choose a wheelbarrow that you can easily push around even if there are already something on it. Avoid choosing something that will make it harder for you to move, as this can cause strains and such. Consider these things when choosing a wheelbarrow that you can use for your garden. In this way, you will be assured that you are buying the right one. Last but not the least, a wheelbarrow’s volume is necessary is also important so knowing all about it is important. Here’s everything that you need to know about a wheelbarrow’s dimension, weight, and ball bearings. Typically, the wheelbarrow has a particular volume of eight cubic feet and is 55 lbs. When it is empty. The measurements of these wheelbarrows are thirty inches in height, thirty inches in width, and sixty-five inches in length. One of the most important things when it comes to buying a wheelbarrow is the weight. If your wheelbarrow has eight cubic feet, it means that it can hold four hundred and sixty pounds of water or twelve hundred pounds of concrete. Just always put in mind to avoid overloading the wheelbarrow to avoid any kinds of injuries. The ball bearings are the ones responsible for facilitating the speed of the wheels and the weight capacity of the bearing. If you notice the bearings are getting old, it would be wise to immediately replace them since old once can tend to lessen the performance of the wheelbarrow. Here’s a video on how you choose a wheelbarrow. After reading all the information above, you are probably ready now to know the best wheelbarrow that you can have on the market today. Get to know each one of them by the information provided for you below. Marathon Dual-Wheel Residential Yard Rover Wheelbarrow is available in different colors, where the wheels are filled with just enough air for it to easily be maneuvered, balanced, and be lifted. The handle has a cushion, which will let you use it comfortably. 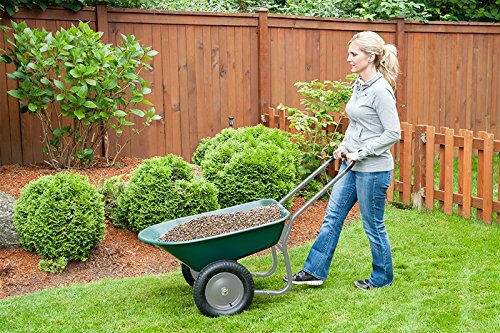 This wheelbarrow features a five cubic foot tray that is rust proof and has a load capacity of up to 300 pounds. It is also very easy to install, so you don’t have to worry about anything at all. The Marathon wheelbarrow weighs a total of 29 pounds, which is less than 25% than the usual wheelbarrow that can be purchased in the market today. Another good thing about this is it can easily be pulled and push around the garden, for ease of use. Gorilla Carts GOR866D Heavy-Duty Garden Dump Cart is equipped with pneumatic tires that are 10 inches and has a frame that is made out of stainless steel. It weighs 32 pounds and can support up to 600 weights of loads. 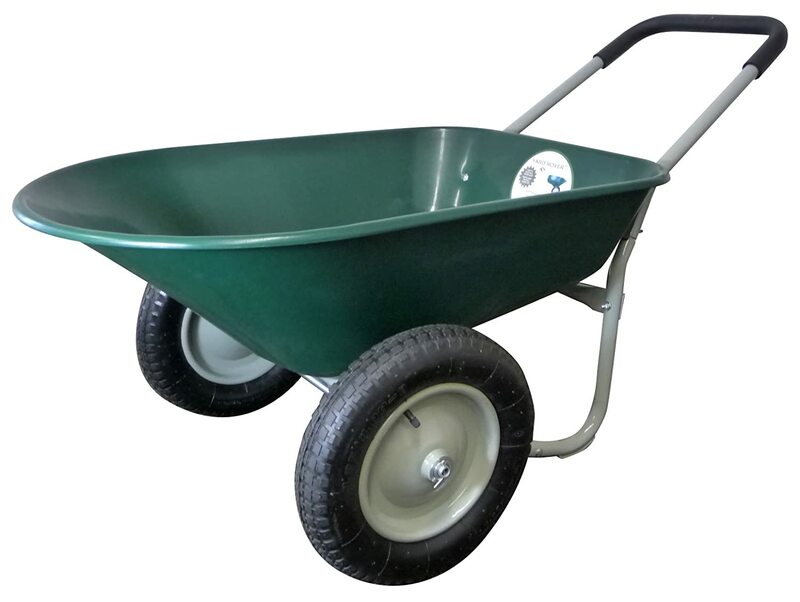 This wheelbarrow has a bed that measures 36 inches by 26 inches and is a rust free finish. The bed is useful for supplies and garden tools without worrying about rusting and such. The Gorilla wheelbarrow is a heavy duty cart and has a dump that is patented, which makes the unloading of materials easily and fast. Another good thing about the Gorilla wheelbarrow is that it has a handle that is convertible, which can be hooked behind the ATV or lawn tractor. Polar Trailer 8449 7 Cubic Feet Heavy-Duty Cub Car﻿t has a capacity load of up to 400 pounds and has a pack size of 7 cubic feet. It only weighs 35 pounds and is made out of polyethylene tub. The total measurement of the wheelbarrow is fifty inches by twenty-eight inches by twenty-nine inches. The tire size, on the other hand, measures sixteen inches by four point eight inches. 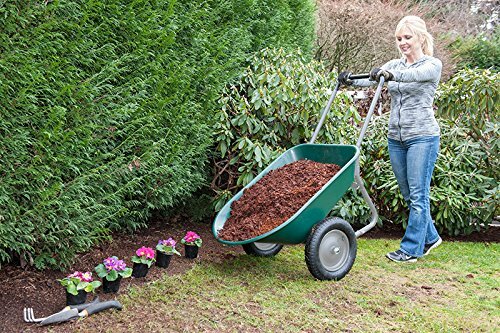 The Polar Trailer wheelbarrow is light in weight, which makes it easier for you to move it around your lawn. Another good thing about this is that it features an optimum balance, which makes hauling of heavy loads easier than usual. Ames Easy Roller Poly Yard Cart will help you to work with your lawn quickly and easily. This wheelbarrow combines 4 cubic feet of capacity storage and four strong wheels. It also has a tool tray that is integrated, which will help you to carry your tools anywhere you need them to do. This product is made out of all poly which makes is resistant from corrosion and is known to be very durable. The Ames wheelbarrow will help you carry whatever gardening things you need because of the ten-inch front wheels and the five inch rear wheels that it has. No matter what your gardening needs are, the Ames wheelbarrow will help you get things done in a short period. Suncast LC1250D 15.5 Gallon Capacity Poly Rolling Lawn Cart is entirely used for transport and storing of mulch, outdoor items, and even dirt. The material that it is made of is durable, which means that it can last for an extended period. This wheelbarrow has a capacity of 15 and a half gallon. The Suncast wheelbarrow is designed differently from any other wheelbarrows in the market since it has an axel that is made out of metal. Another good thing about this wheelbarrow is that it can also serve as a multipurpose since it can be a cooler as well. All you have to do is store some ice in it and put some drink which you can quickly pull outdoors for tailgate and barbecue gatherings. This cart will meet all the needs that you have. Having a wheelbarrow is a convenience to for everyone, which is why people are also looking for ways on how they can make it last long even if it is made out of durable materials. The good thing about a wheelbarrow is that it does not require too much maintenance at all. All you have to do is to occasionally oil and grease the parts that are movable. The pieces that can be moved should be kept dry and clean. If there are parts that need to be replaced, make sure to immediately replace them to avoid having problems while you are using them. Everything that you need to know is stated above, and all you have to worry now is the wheelbarrow that you should choose. Just make sure to choose something that will provide your needs.